Lactobacillus acidophilus, or L. acidophilus, is the most commonly used probiotic, according to the University of Maryland Medical Center. It is especially beneficial for intestinal health because it breaks down foods to create substances such as lactic acid. This creates an environment that is not suitable for harmful bacteria. L. acidophilus is also beneficial for regular digestion, constipation, lactose intolerance symptoms and enhanced immunity. 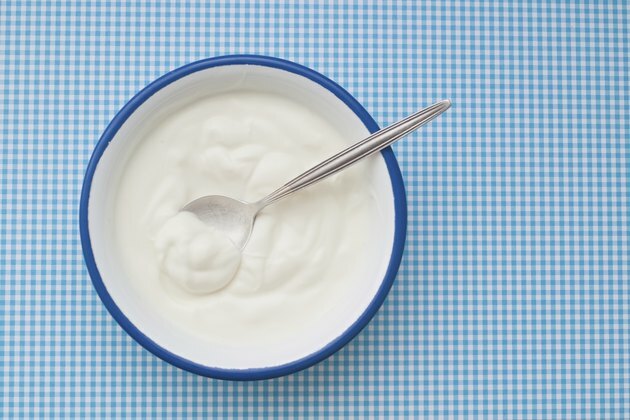 Lactobacillus bulgaricus and Streptococcus thermophilus are two bacterial cultures seen in most yogurts on the market. Some also include L. acidophilus. Stonyfield Farm yogurt supplies L. acidophilus, as well as five additional strains of beneficial bacteria. These include Streptococcus thermophilus, Lactobacillus bulgaricus, bifidus, Lactobacillus casei and Lactobacillus rhamnosus. Stonyfield's Greek, Smooth & Creamy, Blends and Fruit on the Bottom varieties of yogurt contain all five of these live and active cultures. Stonyfield also offers a non-dairy soy-based yogurt that contains L. acidophilus, bifidus, Lactobacillus bulgaricus and Streptococcus thermophilus for those who cannot or choose not to consume dairy products. Dannon offers a variety of yogurts containing L. acidophilus. While every variety of Dannon yogurt contains live and active cultures, only the all natural, classics, and light & fit varieties are stated to contain L. acidophilus. Dannon is known for its Activia line of yogurts for digestive health, but these varieties of yogurts do not contain L. acidophilus. Activia contains the active cultures Lactobacillus bulgaricus, Streptococcus thermophilus and Bifidus Regularis. Fage is a Greek-style strained yogurt that contains L. acidophilus and four additional live and active bacterial cultures. These cultures include S. thermophilus, bifidus, L. bulgaricus and Lactobacillus casei. Both the total and fruyo lines of Fage Greek-style yogurt contain all five of these bacterial cultures. All seven varieties of the Greek-style Chobani yogurt include the active cultures L. acidophilus, S. thermophilus, L. bulgaricus, bifidus and L. casei on their ingredient lists. Does Activia Work for Constipation?